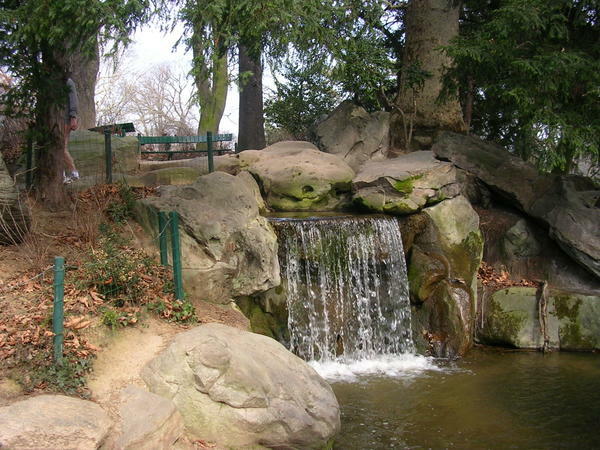 The Bois de Boulogne is a park located along the western edge of the 16ème arrondissement of Paris, near the suburb of Boulogne-Billancourt. It has a vaste area, it is more than two times larger than Central Park in New York, and more than three times larger than Hyde Park in London. These "Boulogne Woods" are a remnant of the ancient oak forest of Rouvray, which was first mentioned in 717, in the charter of Compiègne. Stepping back to the 21st century, if you are working at The La Defense, in one of the 3.5 million m² of offices dispatched in a bunch of business highrises, and you love running, then this place is ideal for you! 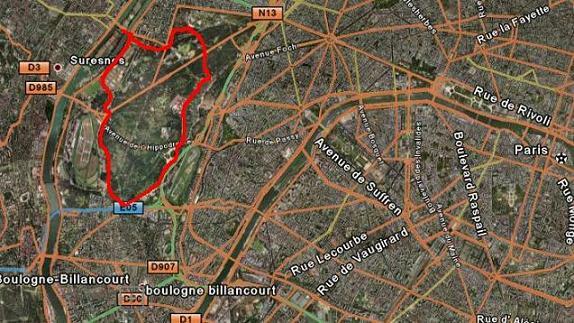 I’ve used to run this track when i was working at La Defense, starting from the Ile (Island) de Puteaux. There is a sports club with tennis courts, showers, water, snacks and a free parking lot. All you need! By public transport: get off the metro line 1 at the station "Esplanade de la Defense". The walk down the river Seine having the skyscrapers behind you on the right side. After a 10 minutes walk (or run? ), at the first bridge (Pont de Puteaux) turn left to cross it. At the middle of the bridge take the small road on your right and there you are. By car, take the D7 road along the Seine river until the bridge Pont de Puteaux. The parking lot has nearly always free places, especially early in the morning at weekends. 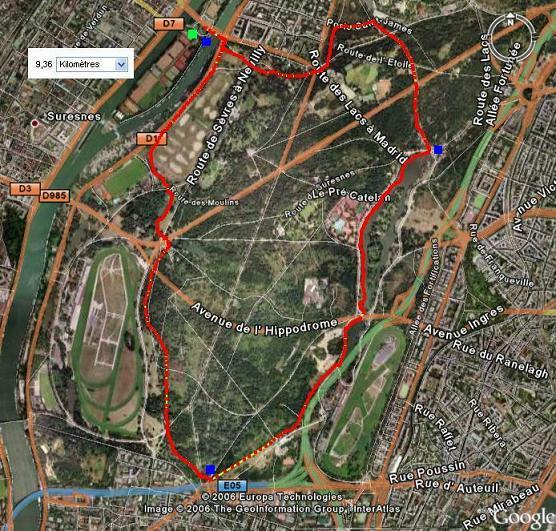 The track: The total length is about 9.3km, bringing you back to the departure point. From the sports club, return to the top of the bridge to the starting point (the green point on the map). Turn to the right and cross the bridge and the quayside completely, then turn to the right. Follow the path straight between the quay and several football and soccer fields for around a kilometer. When the path starts to turn left to go around the football fields, follow it until a small road. Cross it and keep on the left side of a small lake until you come to a big crossroad. On your right you’ll see the hippodrome of Longchamp. Cross the crossroad diagonally and enter the forest. There is a multitude of paths, use the rightmost suitable for running. For around a kilometer you’ll run slightly uphill. At the end of the path you should find a rotary named "Carrefour des Anciens Combattants" , turn left and cross the road to follow an asphalted track. Keep running straight uphill. The asphalted track will soon turn again into a trail. Follow on until you come to the Lower Lake. Along its left side reach the Upper Lake, still keep along the left side of this one. At the end of the Upper Lake, turn right and run parallel to a small road. Now it is going easier, running all the way back down! Arriving at another small lake, turn left again and along it’s right side you’ll come to another big crossroad. Cross it diagonally and keep running for around 500m. On your left you’ll see soon the football fields you perceived when starting. A small sprint up the bridge and there you are just having done nearly ten kilometers! Congratulations!! Water point: There are several, especially near the Upper and Lower Lake. I noted the blue points on the map. At the sports center, of course, there is drinkable water. You can buy snacks there as well. To do a long run, what is the best route to take? Is there a pathway longer than 9.3 km? I would be careful running in certain areas during the day. 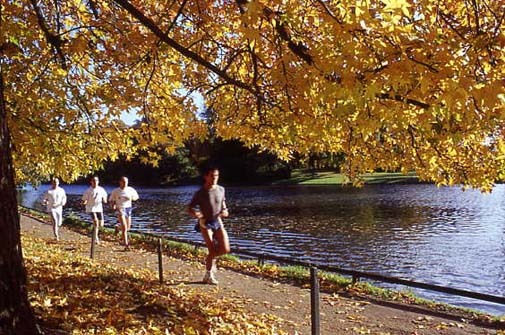 I am a 21 year old petite female, and I have run here most of the time without any problems. However, if you are running alone and if there are not too many people around, it may be better to stay on main trails and not the smaller trails that weave through the forest. Just the other day I was running through these smaller trails at 3 in the afternoon. Not many people were around, and a scary man literally chased me for about 11 minutes of my run and I passed a few prostitute tents. So I’d say that it is safe, but stay where there are more people around, especially if you are running alone or look like an easy target, as I do. Happy Running! Very good website online, pleasure to see you! Vous recherchez un nom de domaine avec enregistrer un nom de domaine, vous aurez sa disponibilitÃ© rapidement et aisÃ©ment. We are in Paris for the Rugby this weekend and are trying to find a French team for a 7 aside friendly football game for a laugh possibly a 2:00 pm KO. Any ideas where to start or who I could possibly call? Free flash games at hotel a paris, play your favorite games. "Before and After Shots of Joggers"? This was doomed from the start. We runerns look great after and before a run. It’s only joggers that don’t look great after a jog. As for Mark, the runner’s high thing is catching up to you. You’re going to pop an aneurysm keeping up the race face like that.